Compact construction equipment is gaining popularity in forestry, logging, and construction. A John Deere skid steer is a prevailing workhorse in the field that’s gaining momentum due to its versatility, maneuverability, and power. Read on for further information on skid steers and specific John Deere models. John Deere skid loaders (or skid-steer loaders) are some of the best in the business, and for good reason. These mainstays of the construction field offer incredible power in a small body, which in turn allows for greater maneuverability in tight spaces. The small size of the vehicle itself means smaller trucks and trailers are necessary for transport (reduced fuel and operating costs!) and a lower overall cost of the skid steer at time of purchase and during maintenance than larger front loaders. The comparative smaller size of the John Deere skid steer yields one of its greatest assets: enhanced visibility. Low to the ground Construction and Forestry equipment provide better sight lines for the machine operator, which in turn improves safety and increases productivity. The operator also has an easier time handling the machine due to the controls inside the skid loader, because they are intuitive and comfortable to use; this helps reduce the necessary operating costs due to driver certifications because the machine isn’t as complex and takes less training than its cousins in the field. A skid steer is one of the most popular compact equipment choices due to its adaptability: it can be transformed into a wide range of tools using skid steer attachments. The metal bucket that typically comes pre-attached with the skid loader can be swapped out with a variety of attachments that make it a useful piece of machinery for many industries including construction, forestry, landscaping, and warehousing. Attachments like augers, breakers, and trenchers make a skid steer a versatile construction tool. Mower attachments, rakes and seeders turn these machines into landscaping or farming equipment. Switching to a pallet attachment turns a skid steer into a forklift capable of doing warehouse heavy lifting. The John Deere skid steer has more than 100 attachments available that will help you make better use of your machine, increase productivity, and create better value on your job site, no matter the industry. 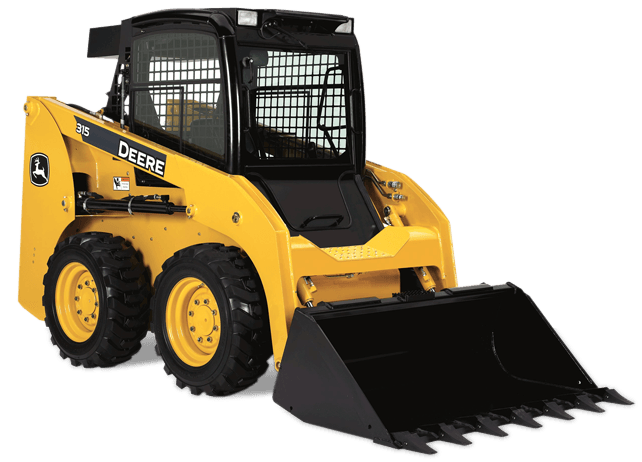 Let’s compare a few John Deere skid steers for sale currently. The 315 is a popular model that offers a lot in a compact size machine. It has a 2.4L turbocharged diesel engine, is Interim Tier 4 emission certified, has four-wheel-drive powertrain, and comes complete with computerized in-cab monitor diagnostics. The 315 has a tipping load at 3,000 pounds, and operating weight of 5,200 pounds. It also has an impressive width of only five feet, allowing for greater control and maneuverability in tight and confined spaces. The larger 318E also has an emission certified engine, and has an enhanced lift height to the hinge pin and improved reach at truck beds. New options include ride control, keyless start, and courtesy lighting. The 318E has an impressive tipping load and 100+ worksite pro attachments that enable this workhorse to easily transition from construction to landscaping to forestry work. Whether you choose the 315, 318E, or another John Deere skid steer and available skid steer attachments, you’re guaranteed to have the right tools for the job. John Deere skid steers take you wherever you need to go, and can handle whatever task you throw at them. In fact, they’re perfect for the nastiest weather and road conditions you can find, with the available snow blower, angle broom, sweeper, and tree spade attachments. Check out our new and used inventory of John Deere and Hitachi construction & forestry equipment and more. Trust us to keep you moving.